A two double bedroom, first floor apartment, set within this substantial period property within this much sought after location close to the City Centre. The well presented property comes to the market with the added incentive of having ‘no upward chain’ thus helping to simplify the whole buying process. 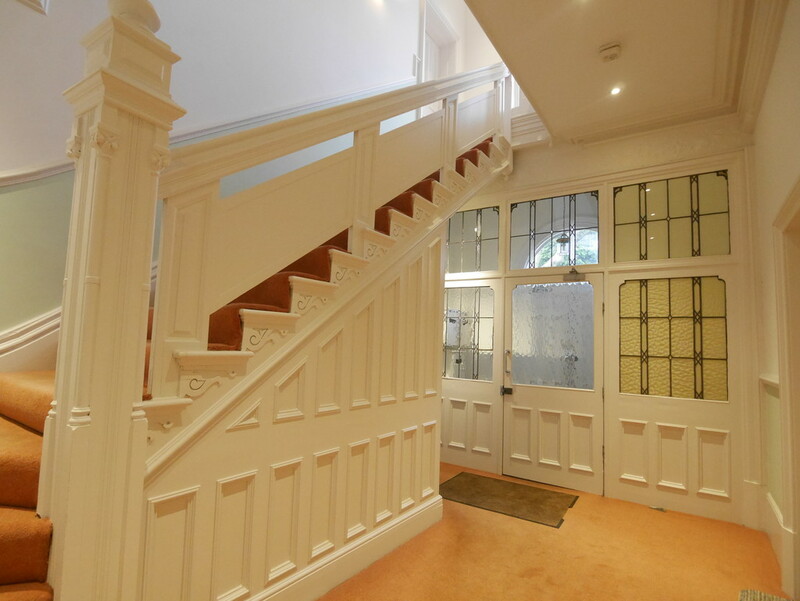 The property has been tastefully and thoughtfully created to give generously proportioned living space together with light and airy communal areas with a most impressive reception hallway and staircase. The property also has use of the delightful communal gardens along with a parking space and garage access via double electric gates for added security. In brief the accommodation comprises communal reception vestibule and hallway, first floor landing where you will find the entrance door to the apartment which in turn has reception hallway with utility room off, lounge/ dining kitchen with a range of appliances, two double bedrooms both having dual aspect windows with the master having a dressing area with built in wardrobes and en suite shower room. The separate bathroom completes the accommodation. Taking all of the above factors in to account together with the location of the property; we would strongly recommend an internal viewing in order to appreciate all this lovely first floor apartment has to offer; contact us now to book your personal viewing appointment. ENTRANCE DOOR Intercom entry system. ENTRANCE VESTIBULE Communal entrance vestibule with locked door through to the communal reception hallway with inset leaded glazing, an impressive reception space with ceiling mouldings, wood panelling and decorative balustraded up to the first floor landing. FIRST FLOOR LANDING Ceiling mouldings, deep skirting and a full height leaded window allowing natural light to flood the space. This is where you will find the entrance through to No.4. RECEPTION HALLWAY Reception hallway with wooden panelled entrance door, video entry phone, radiator, deep skirting sand panelled doors to rooms and walk in utility cupboard with plumbing for a washing machine. LIVING SPACE 16′ 6″ x 13′ 4″ (5.03m x 4.08m) Full height sash, single glazed window, feature fireplace and hearth with inset coal effect gas fire, wall light points, deep skirting, ceiling cornice, wall light points, radiator and open through to the dining kitchen. DINING KITCHEN 16′ 6″ x 6′ 2″ (5.03m x 1.90m) Fitted with a range of wall and base cupboards with work surfaces over, one and a half bowl stainless steel sink unit and drainer, splashbacks, built in electric oven and gas hob with canopy hood over, integrated fridge freezer, integrated dishwasher, built-in microwave, cabinet and recessed lighting, laminate flooring, radiator and full height, single glazed, sash window. BEDROOM ONE 13′ 9″ x 11′ 9″ (maximum plus dressing area) (4.20m x 3.60m) Dual aspect, single glazed, sash windows, radiator, built in wardrobes, deep skirting, wall lights and door through to the en-suite. EN-SUITE Fitted with a contemporary suite comprising low flush WC, wash basin with cupboards under and corner shower cubicle with mains shower having chrome fitments including a rain shower and normal shower head, tiled walls, heated chrome towel rail, recessed lighting and extractor. BEDROOM TWO 13′ 11″ x 9′ 9″ (4.26m x 2.98m) Dual aspect, single glazed, sash windows, radiator and wall light points. BATHROOM Fitted with a modern white suite comprising low flush WC, pedestal wash basin and panelled bath with mixer tap shower, tiled walls, heated towel rail, extractor and opaque, single glazed, sash window. OUTSIDE An imposing, period, property of substance with electrically operated, double gates leading to the parking and garage and furthermore round to the beautifully landscaped rear garden which can be enjoyed by all the residents of the building. LEASE / GROUND RENT INFORMATION There are 108 years left on the lease. The ground rent for the property is £250 per annum. The service charge is £1163.98 per annum (Please note any client wishing to purchase must ensure these figures are correct before purchasing the property).